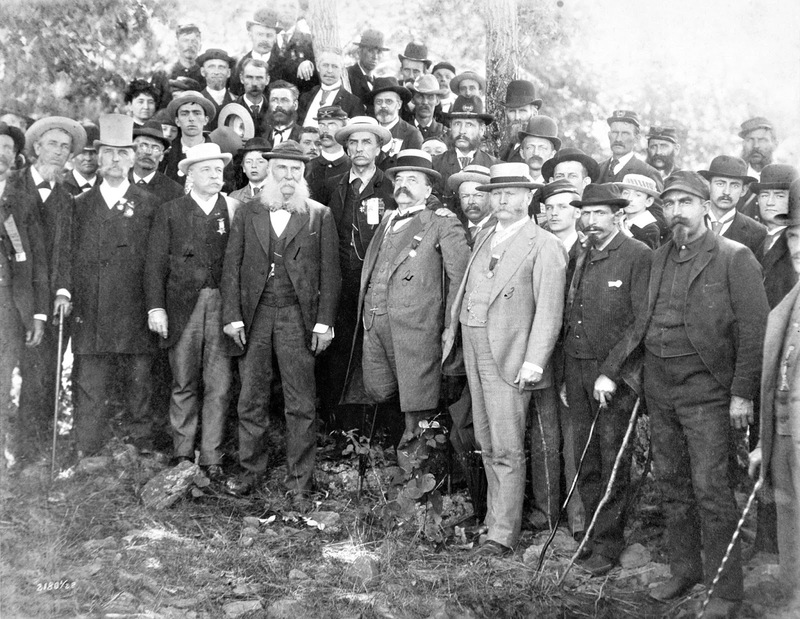 pose in Gettysburg on July 3, 1888. Sickles lost his leg at Gettysburg on July 2, 1863. Longstreet and his former Union adversaries in Gettysburg. Like this blog on Facebook. Sporting massive, gray whiskers and a cleanly shaven chin, a "vigorous" James Longstreet attended a huge reunion of veterans in Gettysburg in late June and early July 1888, the 25th anniversary of the battle. For the 67-year-old former Confederate lieutenant general, the emotional visit was his first return to the area since the great battle. "There are so many Generals and other chieftains here," a New York newspaper reported, "that a catalogue of them would be as long as Homer's list of ships. Each is a hero to a set." In addition to the old soldiers, most in their 50s, thousands of others jammed the town that, much like in 1863, was ill-equipped to handle so many people. was covered extensively by newspapers. 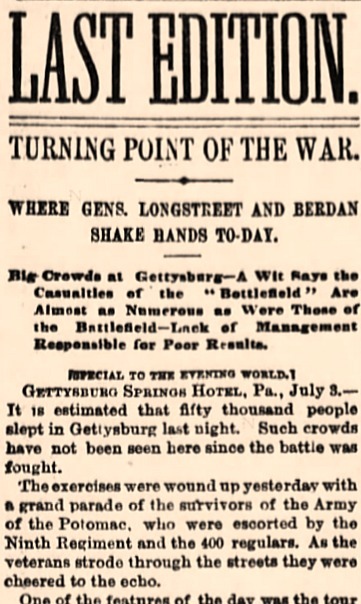 "It is estimated that fifty thousand people slept in Gettysburg last night," the New York Evening World reported on July 3, 1888, perhaps exaggerating only slightly. "Such crowds have not been seen here since the battle was fought." Many Union monuments were dedicated, and veterans trod ground they had fought on 25 years earlier. 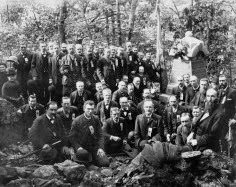 Reunion events, including a special mass for Irish Brigade veterans in the Catholic church in Gettysburg, were held, and old soldiers eagerly searched fields and woods for war relics. 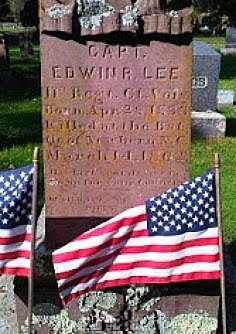 A New Jersey veteran attending the dedication of a monument for his regiment claimed he found in a rock crevice the cartridge box he had hidden there during a retreat in July 1863. Two bullets remained in the bent and rusty relic, which the veteran proudly took home. A Wisconsin soldier scoured Little Round Top for the artillery shell that cost him an arm. He expected to find it, he told a New York reporter, who was highly skeptical. 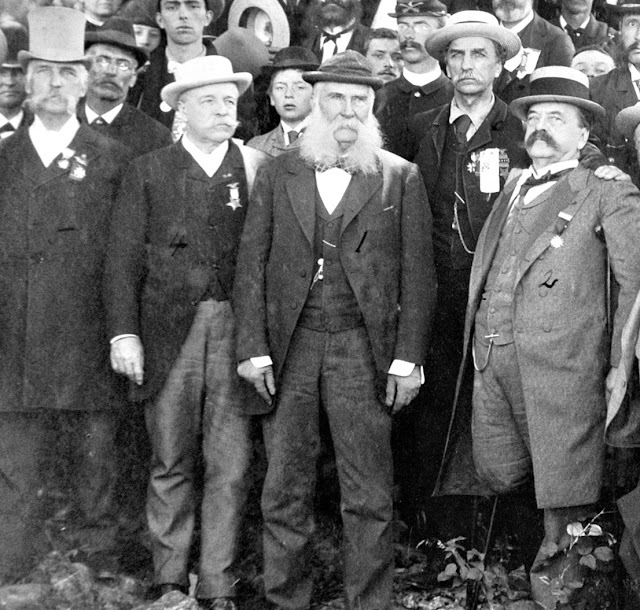 Veterans from both sides were cordial with each other, although Union men reportedly groused that some of their former enemies wore lapel pins adorned with a Rebel flag. Widely covered in the press, the reunion drew mixed reviews. "Yesterday and to-day the scenes and the excitement in this lively borough and its classic surroundings were of a character so exciting, so crushing in numbers of people, so crashing in brass band music and withal so delightful in weather conditions," a Harrisburg, Pa., newspaper gushed, "as to impart a charm to what would otherwise have been unbearable." "There is much truth in this. The town is indeed a poor place for the accommodation of such crowds of visitors as come here. There is not a really good hotel in the village. You cannot buy a New York newspaper at any price. Few Philadelphia papers are received. Carriages are needed to go from point to point, for the battlefield covers an area of twenty-five miles, and the people take full advantage of the crowds and gauge everyone who hires a buggy or a hack. The extortion is worse than that practiced by the St. Louis hotel people during the Democratic Convention. And yet, in spite of all these unpleasant things, the people come, for the sentiment which attracts is more powerful than the feeling of disgust created at the meanness of the people of the place." 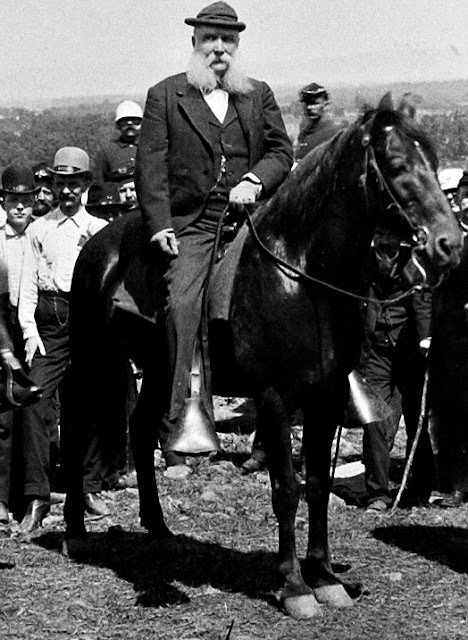 Despite the supposed woes, there was a clear star of the event: James Longstreet, Robert E. Lee's "Old War Horse," who commanded the Confederates' First Corps at Gettysburg. Nearly everywhere the former general went, he drew an appreciative crowd. "No man now in Gettysburg," the Sun wrote of Longstreet, "is more honored nor more sought than he." (In the South, meanwhile, Longstreet was vilified for his support of Republicans and his controversial stand against Lee's decision to charge the Union center on the third day at Gettysburg.) During his stay, Longstreet spoke before Union veterans' groups, who enthusiastically greeted their former enemy, and toured the battlefield where his soldiers shed so much blood. On June 30, the day of his arrival by train in Pennsylvania, Longstreet had a lengthy private conversation at the Springs Hotel, about a mile from town, with 68-year-old Daniel Sickles -- the first time the former enemies had met. As commander of the III Corps at Gettysburg, the controversial Sickles lost his right leg to Rebel artillery on July 2, 1863. While the old foes dined at the hotel, others in the room gawked and "let their dinner go almost untouched." As a group of New York veterans marched through Gettysburg one morning, they noticed Sickles and "Old Pete" in a carriage behind them. 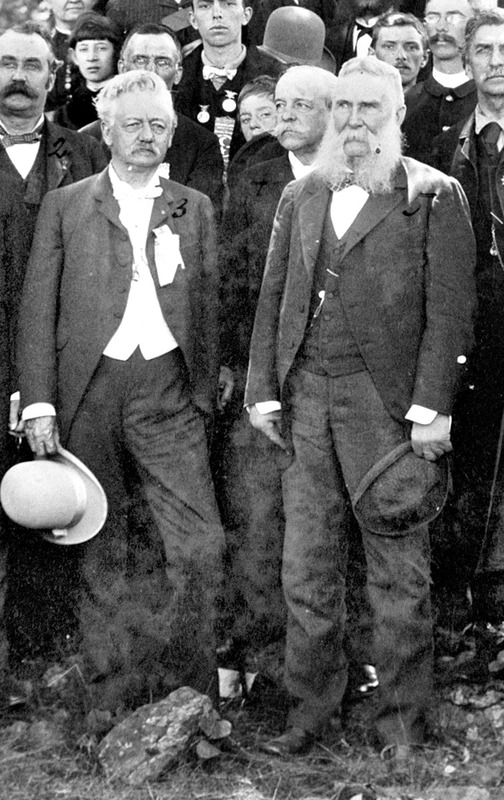 "This was a meeting of blue and gray worth recording," a Philadelphia reporter noted, "and as they passed along the street that led to Seminary Hill and Seminary Ridge the enthusiasm of the crowd who recognized them was something beyond description." With Sickles and other former Union big-wigs, Longstreet visited the notable sites -- the Peach Orchard, Wheatfield, Devil's Den, Little Round Top and others. Little had changed, the old general observed, since his soldiers had made desperate assaults on the Round Tops on July 2, 1863, and, a day later, at the "Bloody Angle" during Pickett's Charge. "A great mistake," said Longstreet, who mulled battle strategy and tactics as he toured the field. 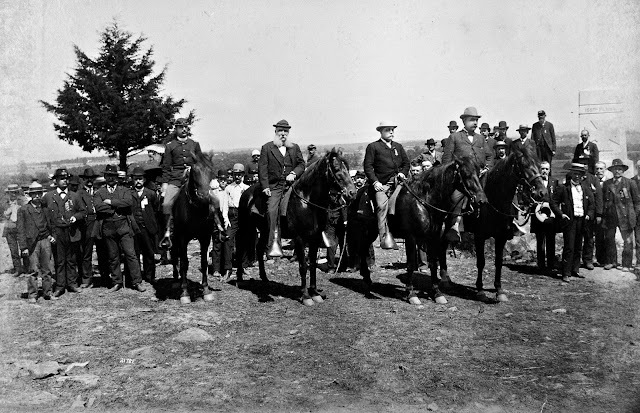 When Longstreet began a tour of Gettysburg on horseback with Butterfield, Berdan and others, a "great crowd" gave the group "three ringing cheers." After they reached the summit of Little Round Top, word quickly traveled of Longstreet's presence there. Union veterans gathered nearby for a monument dedication rushed toward their former adversary. "Boys, here's Longstreet," said Sickles as he sat at the foot of a tree, "and he meets us once more on Round Top." Three rousing cheers from the crowd of about 100 "went surging through the shimmering air to the plain below." former Union general Henry W. Slocum. 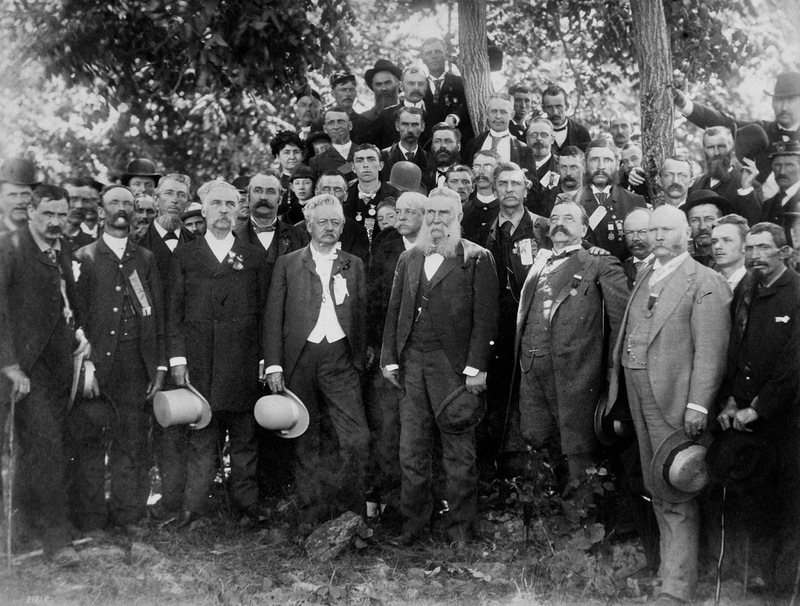 Union veterans and Longstreet on July 3, 1888. 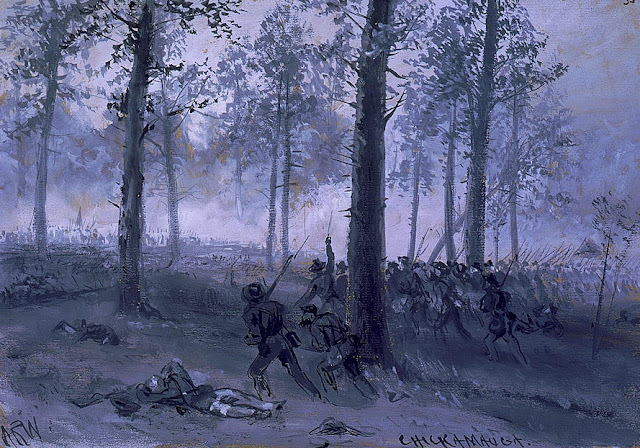 On July 1, Longstreet "almost broke down" during a speech before thousands of First Corps veterans of the Army of the Potomac in Herbst's Woods, where Union General John Reynolds was killed on the first day of the battle. As he walked to the massive speakers' stand, he was greeted by a Rebel yell, the Gettysburg Cornet Band played "Dixie" and veterans eagerly sought him out to shake his hand or to exchange pleasantries. Among them was a one-legged Union vet, who told Longstreet: "General, I fought against you at Round Top. I lost a wing there, but I am proud to meet you here." After Longstreet took his place on the stand, Chamberlain shouted, "Comrades, you see on this platform one of the hardest hitters whoever fought against us. I propose we give three times three for General Longstreet, one of the best Union men now in the country." The crowd erupted, surging toward the stand and "showering God bless you's on him." After Longstreet had taken his place on the platform, it collapsed, falling several feet, but no one was seriously hurt. 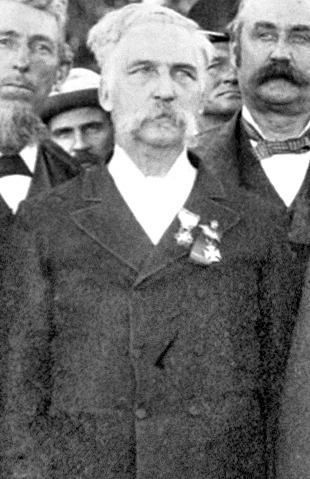 "Smiling and bowing right and left, the General addressed the veterans as comrades and said that although he had not arrived in time to participate in the first day's battle he was proud to be present to-day to commemorate the glorious fight and mingle with those brave men who know how to appreciate heroism which will give up life for country's sake," a Philadelphia newspaper reported. In his speech, Longstreet, who was persuaded by Gettysburg-based battlefield photographer William Tipton to pose during his visit, called the third day at Gettysburg the greatest battle ever fought. "But now," he said, "the times have changed. Twenty-five years have softened the usages of war, and our meetings now are for more congenial purposes. The ladies are among us with their bright smiles. God bless them, and grant that they may dispel the delusions which may come between the North and the South, and prepare the way even as the bride is prepared for the bridegroom's coming, strewing their paths with flowers of everlasting peace." The next day, Lee's "Old Pete" received a telegram from the widow of General George Pickett, who had died nearly 13 years earlier. "Your friend and comrade has gone to join the heroic column of American soldiers in the land o' the leal," Sallie Pickett wrote, "but his widow and son greet you from afar upon the field which consecrated the blending of blood of brave men." At the Grand Reunion on July 2 in the national cemetery, Longstreet shared the rostrum with Sickles, Gordon, Barlow and other notables from the war and spoke briefly before a crowd estimated at 5,000 people. "The actors," the New York Times reported, "were the very men who defended the ridge on whose slopes the cemetery lies against the repeated assaults led by the very men 25 years ago this very day who joined them here now in pledges of friendship, loyalty to a common flag and unity of devotion to a common country. All -- place, scene, and the living figures of the men themselves -- were inspiring." 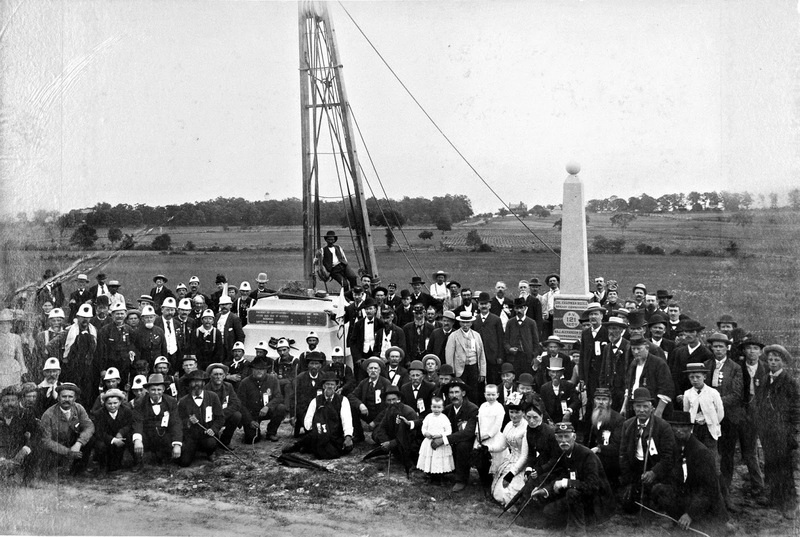 Also that day, Longstreet attended the dedication of the monument for the 95th Pennsylvania, "Gosline's Zouaves," one of several such events he attended during his Gettysburg visit. When he saw the regiment's ragged battle flag, pierced by 81 holes, he cried and "tenderly raised the tattered folds and pressed them to his lips." "Every G.A.R. man," a Northern veteran wrote, "has a kindly word for General Longstreet." Postscript: On the trip back to his home in Georgia, the train carrying Longstreet derailed near Orange Courthouse, Va., leaving a scene that, according to a reporter, "no pen or tongue" could describe. Longstreet escaped unscathed, but many were injured and eight passengers were killed. 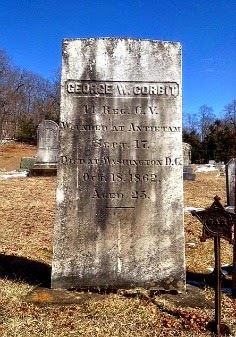 Among the dead was a Confederate veteran from New Orleans, who had lost a leg at Gettysburg in 1863. He, too, was on his way back home from the great reunion. Longstreet appears in a cropped enlargement of the William Tipton image below. George Meade's former chief of staff, near the summit of Little Round Top. The 155th Pennsylvania monument appears in the right background. Have something to add (or correct) in this post? E-mail me here. -- Harrisburg (Pa.) Independent, July 2, 1888. -- Harrisburg (Pa.) Telegraph, July 5, 1888. -- New York Evening World, July 3, 1888. -- New York Sun, July 1, 1888. -- New York Times, July 2 and 3, 1888. -- New York Tribune, July 4, 1888. -- Philadelphia Inquirer, July 3, 1888. -- Philadelphia Times, July 3 and 5, 1888. -- Staunton (Va.) Spectator, July 18, 1888. -- The Times Picayune (New Orleans), July 3, 9 and 13, 1888. Excellent post John. It must have been an emotional occasion! Thanks, John. This one was fun. Pounded it out at Starbucks. Newspapers.com is amazing resource. Well written and well done sir! I bet it would have been something to have been there with those men. Very interesting and well-written. And the sight of Longstreet with that peculiar beard is remarkable. Also: Was this the same period when lawsuits were being brought as to which state could claim a specific site on the battlefield based on the valor displayed on that particular site by its volunteers? I was just at Gettysburg a couple of days ago and, although I've been there many times, it never loses its charm as the premier Civil War battlefield. Stories like this continue to make it come to life. I looked at the Longstreet monument in a new light, appreciating him more, and seeing him also as the old "War Horse" visiting the battleground as an aging veteran, with a tear and twinkle in his eyes (and mine too). wonderful article, covering the feeling and emotion of these men returning to the location that probably produced more than one nightmare for anyone of them. Inspiring story of grace and dignity. Thank you for your work here. Interesting and moving. Pictures great,too. Thanks again for yet another note honoring our heritage. John, thank you for telling the story of the 1888 Gettysburg reunion. Very moving. Surely a very emotional visit for those guys. Really enjoyed the piece on Mrs Longstreet as well. Incredible that fine lady was with us up until the 1960s! An extremely interesting article; thanks for contributing it. Very interesting and great pictures. Thank you so much for posting, I'll be looking forward to many more !! Kudos, John. Great article! 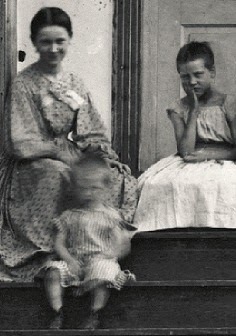 I've never seen these pics before nor was I familiar with the aspects of the 1888 reunion you've shared. Thanks for your fine work. Awesome post. Funny how personalities never change, Longstreet and Chamberlain classy and true; Sickies, the man who damn near lost the battle disobeying orders looking like a 'Conquering hero', and Slocum who failed to support the Union troops west of Gettysburg on day 1 ( well at least he doesn't look so self important as the politico- general, Sickles. His wounding was bad for the CRA but good for the Union. Thanks for a great read John. From what I've read Longstreet may not have been so welcome in the some part of South at that time, no? I think he was one of the few ex-Confederate generals who became a Republican. Thank you for sharing this information. I fear too many people forget the history of the struggles we faced and the brave men who faced them to create this great nation. Thanks again!!!! Thanks for telling the truth about our history!! This is wonderful!!! Thank you for sharing!!! 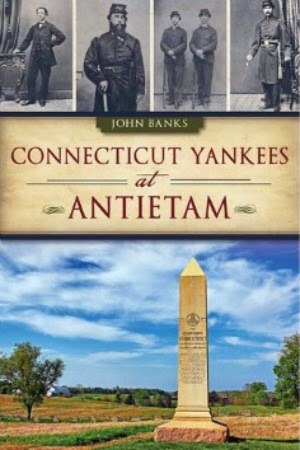 John Banks is author of two published books on the Civil War: Connecticut Yankees at Antietam and Hidden History of Connecticut Union Soldiers, which feature profiles of soldiers and others. His work has been featured in such notable publications as The New York Times, Civil War Times, Civil War Monitor, Civil War News, America's Civil War and Military Images. Banks, who attended Mount Lebanon (Pa.) High School, graduated from West Virginia University (B.A. in journalism). A longtime journalist (The Dallas Morning News and ESPN), he is secretary-treasurer of The Center for Civil War Photography, a member of the Civil War Trust and a board member of the Save Historic Antietam Foundation. Digitally savvy professional journalist. No fear as editor or writer. 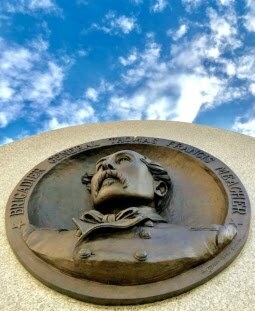 Click on Irishman Thomas Meagher monument photo for more. 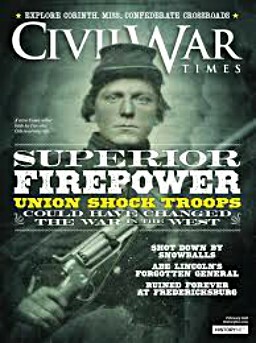 My stories have been featured in The New York Times, Civil War Times, America's Civil War, Civil War Monitor, Military Images and elsewhere. Read the latest story by clicking on the image. 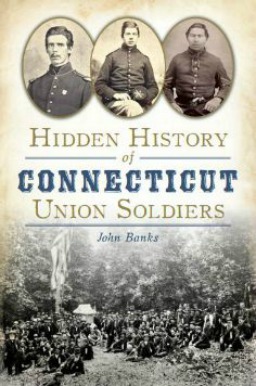 My second book, "Hidden History of Connecticut Union Soldiers" (History Press), is available for purchase. You can order it from amazon.com or email me at jbankstx@comcast.net for information on how to get an autographed copy. 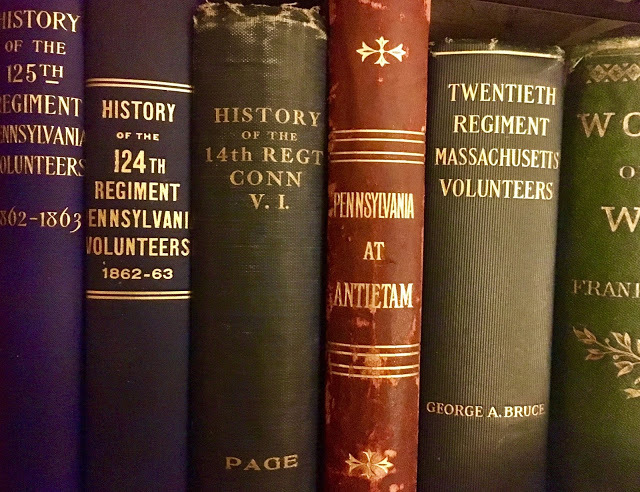 "Connecticut Yankees at Antietam": Stories of soldiers from Connecticut who served in the four regiments from the state who fought during the bloodiest day in American history. Click on image for ordering details. If you want to purchase a signed copy, email me at jbankstx@comcast.net. Get blog updates and much more when you LIKE John Banks' Civil War blog. A one-stop shop for digitized regimental histories. 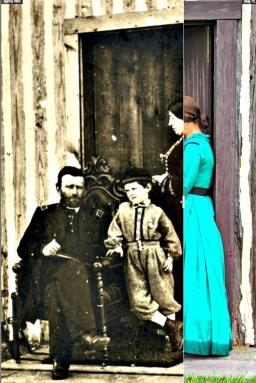 Compare Civil War-era images to photos of the same sites today. (Images thread may load slowly. We had good accommodations and set down to a table and ate like folks instead of hogs. 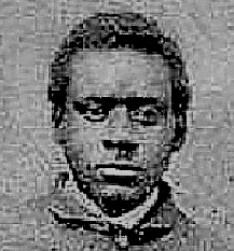 Click on image of Milo Freeland of the 54th Massachusetts for more soldier stories. The 16th Connecticut was routed at Antietam and many soldiers in the regiment were later imprisoned at Andersonville and elsewhere. 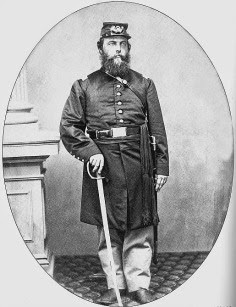 Click on the image of Company K captain Newton Manross, killed at Antietam, for more on the hard-luck regiment. Posts on the Battle of Antietam, my favorite Civil War topic, may be found by clicking on the image of "The 40-Acre Cornfield." From Burnside Bridge to Bloody Lane to the 40-acre Cornfield, view an extensive collection of interactive battlefield panoramas. From Little Round Top to Benner's Hill, view a collection of interactive panoramas of the battlefield. Interactive panoramas from Cedar Mountain, Chickamauga, Cold Harbor, Harris Farm, Manassas, Malvern Hill, Salem Church, Spotsylvania Courthouse and more. View battlefield images by the renowned Gettysburg-based photographer on my Pinterest page. The faces, graves and memorials of soldiers from Connecticut who were killed or mortally wounded on Sept, 17, 1862 -- the bloodiest day in American history. Click on image. Enlargements of Alexander Gardner images allow you to see Antietam like you've never seen it before. Click on image above. John Banks 2015. Picture Window theme. Powered by Blogger.